Extended again thru April 25! 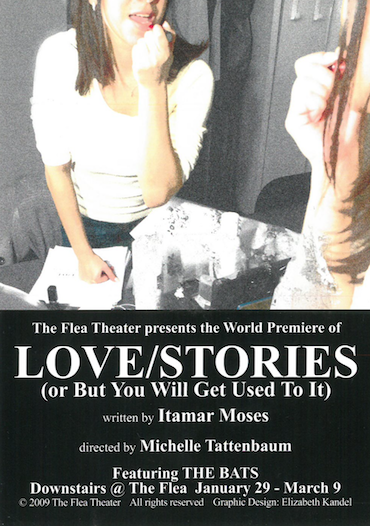 The Flea Theater presents the World Premiere of Itamar Moses’ LOVE/STORIES (or But You Will Get Used To It), a collection of five short new plays. Moses is the author of The Four of Us, Bach at Leipzig, Back Back Back and Celebrity Row. A casting session for a play about a love affair goes awry. A talk-back with a theatre audience becomes the occasion for a life-altering choice. A couple moving in together finds that greater intimacy can have surprising results. Nothing is what it seems in these five funny and poignant short plays. The production is directed by Michelle Tattenbaum and features a design team consisting of Jerad Schomer (set), Joe Chapman (lights), Jessica Pabst (costumes), Brandon Wolcott, (sound) and Eilzabeth Kandel (graphic design). The play stars Felipe Bonilla, Laurel Holland, Maren Langdon, Michael Micalizzi and John Russo, five members of The Bats, The Flea’s resident acting company. Itamar Moses is the author of Outrage, Bach at Leipzig, Celebrity Row, The Four of Us, Yellowjacket, Back Back Back and Completeness, Reality! (a musical with Gaby Alter), and Fortress of Solitude (a musical with Michael Friedman and Daniel Aukin), and various short plays and one-acts. His work has appeared Off-Broadway and elsewhere in New York, at regional theatres across the country and in Canada, and is published by Faber & Faber and Samuel French. He has received new play commissions from The McCarter Theater, Playwrights Horizons, Berkeley Repertory Theatre, The Wilma Theater, South Coast Rep, Manhattan Theatre Club, and Lincoln Center. Itamar holds an MFA in Dramatic Writing from NYU and has taught playwriting at Yale and NYU. He is a member of the Dramatists Guild, MCCPlaywrights Coalition, Naked Angels Writers Group, and is a New York Theatre Workshop Usual Suspect. He was born in Berkeley, CA and now lives in Brooklyn, NY. Love/Stories extends again through April 25! Performance times vary, see Calendar. Tickets are $20 and can be purchased using the link above. The running time is 1 hour and 30 minutes without intermission. Please note there is no late seating.